This three-storey building was designed by local architect James Chisholm and built in 1882, adjacent to the Bawlf and Benson blocks, for the Harris Implement Company. In 1891, the firm merged with the Massey Manufacturing Company to form the Massey-Harris Company and moved to larger premises nearby. The building was subsequently leased to the Cockshutt Plow Company until 1903 then served as a wholesale boot and shoe warehouse until 1927. After being vacant for several years during the Great Depression, two companies the building for offices until a fire in 1945. The building was purchased in 1951 by Hochman’s Limited, a wholesale footwear merchant. The building was demolished in 2003 to make way for the downtown campus of the Red River College although its exterior façade was retained. 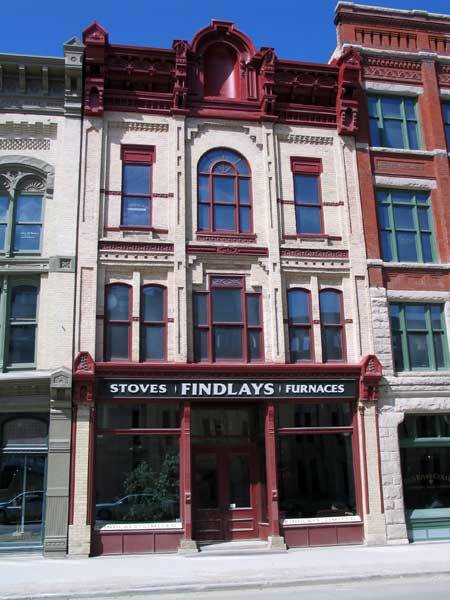 In 2004, the building was recognized with a Heritage Winnipeg Preservation Award. It is a municipally-designated historic site. Harris Block / Hochman Building (154 Princess Street), City of Winnipeg Historical Buildings Committee, June 1979.